< Dirt Devil Mummy Bloggers Event at The Lowry with Mr Stink! If you’ve ever fancied printing your own designs onto fabric or clothing, then you will love today’s tutorial. Freezer Paper offers a wonderful world of craft ideas from clothing to quilts. Simply put, you cut it to make a stencil which is then ironed onto fabric in order to print/paint your chosen design. It’s far more common in the US, but here in the UK it can be ordered from many online craft shops. For those unfamiliar with the process I have created a simple and quick tutorial. Start by creating your design. 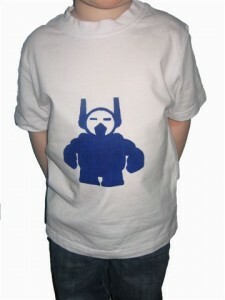 Ours is a robot version of Sean Eskimo (affectionately called Sean Eskibot). 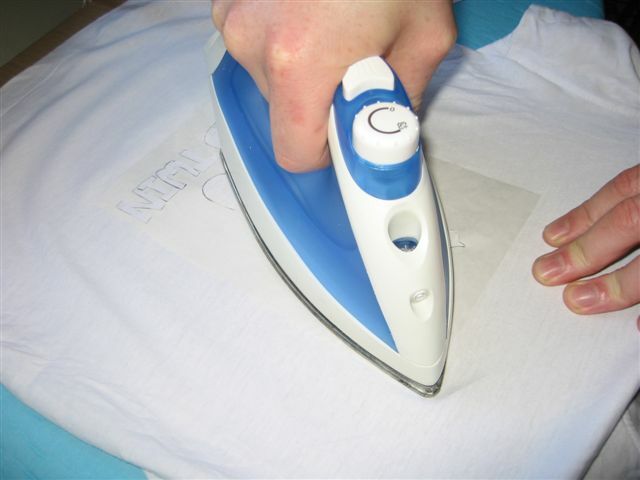 You can either draw or trace your design onto the freezer paper, or it is possible to cut it and print straight from your computer (print the design onto the matt side of the paper). Cut out using a craft knife or scissors. Place your stencil shiny side down onto your tshirt/fabric and iron into place. 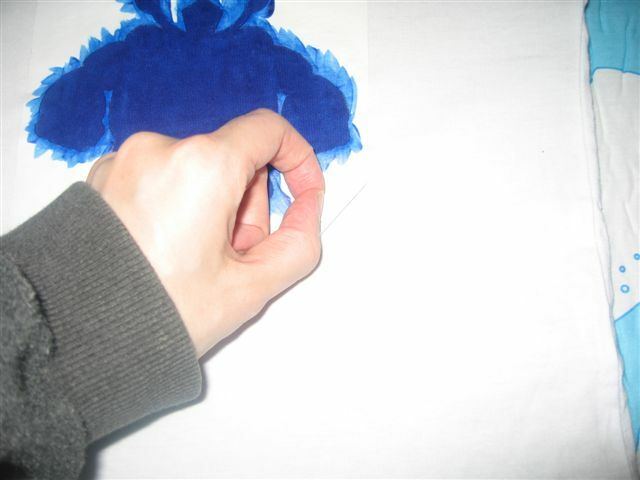 The Freezer Paper will cling on making it super easy to apply the fabric paint. Using a big brush gently apply the fabric paint onto the stencil. Depending on the brand of paint you may be advised to fix between layers. This is normally achieved by placing a cloth over your stencil and ironing on top (make sure the paint has dried first!). Once you have built up the correct depth of colour let the paint dry and then fix according to the packet instructions. Now the fun part! 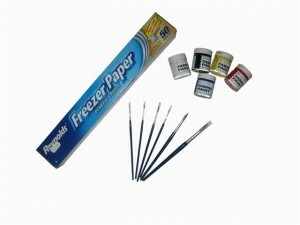 Slowly start to pull off the Freezer Paper beginning at one corner, your masterpiece is finally being revealed! I like to wash the finished designs once before wearing, this returns the fabric to it’s normal softness. It also ensures that the paint has properly adhered, if any comes off just top it up and fix again. You can create multilayer stencils and build up a design using several layers of colour. Just make sure each layer is dry and fixed before you start the next. This entry was posted in Tutorials and tagged design, fabric, freezer paper, paint, print, printing, reynolds, t-shirt, tutorial. Bookmark the permalink.